I got this idea while watching a craft show on Kentucky Educational Television. A lady was talking about a crazy quilt and I thought... why not make a crazy scarf. 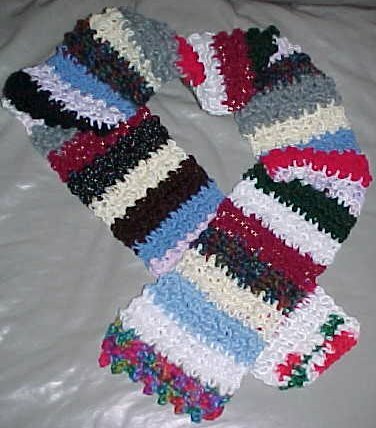 Hope you like the pattern and I hope this helps you use your yarn scraps! Width is approximately 5 inches. Length depends on your preference. I used some Red Heart 4 ply, worsted weight acrylic yarn some Sport weight and some baby weight. I didn't like the look of the thick chenille yarns with this project so I recommend not using "bulky" yarns. R1: Ch16. Sc in 2nd ch from hook. (Tr in next ch, sc in next ch) across. R3: Ch1, turn. Sc in same st. (Tr in next st. Sc in next st) across. R5: Attach new color in last st of previous round. Sc in same st. (Tr in next ch, sc in next ch) across. R6: Ch1, turn. Sc in ea st.
R7: Ch1, turn. Sc in same st. (Tr in next st. Sc in next st) across. Repeat Rows 5-8 with a different color each time until you reach the desired length.